Bicycling and European travel are two of my favorite pursuits. In 1998, I discovered the best of both worlds when I joined a guided cycling tour through the vineyard-clad rolling hills of France’s Loire Valley. In 2004, I made a better discovery—self-guided European cycling trips, priced 50–75 percent less! Since then, my husband, John, and I have taken five self-guided bike trips, touring Austria, Belgium, Italy, Germany, France, and the Netherlands. We booked through European-based cycling outfitter Eurocycle (www.radreisen.at). While we enjoyed all our trips, last August we experienced the best cycling trip—a mostly downhill ride through Austria’s stunning Hohe Tauern National Park, located in central Austria between Innsbruck and Salzburg. A grand view of Stuhfelden's schloss (castle) from our balcony at Gasthof Flatscher. By late afternoon we arrived in Krimml, an alpine village tucked in Austria’s Land Salzburg region bordering Hohe (High) Tauern National Park. We stayed at National Park Hotel Klockerhaus (www.klockerhaus.at), which is near the park and has views of the Krimml Falls. The Klockerhaus features modern conveniences with traditional chalet architecture, including carved wooden balconies bursting with bright red geraniums. At check-in, we presented our Eurocycle hotel vouchers for our first night’s stay, and paid for a second night so we could climb the falls the next day. The balcony of our comfy room overlooked a gorgeous mountain backdrop. With our windows open, the serene surroundings combined with the brisk air made for a peaceful slumber. We awoke to perfect hiking weather—cool and sunny. After breakfast, we drove an hour to Zell am See to turn in our rental car, then returned to Krimml via Postbus, a public bus transport operated by the postal service. We quickly grabbed hiking sticks and backpacks from our room and set off on foot. Within minutes we were in Hohe Tauern National Park, gazing up at the magnificent Krimml Falls, the highest waterfall in the Austrian Alps. Although hiking the falls was challenging, the fresh mountain air was invigorating. Midway up, we stopped at Café Restaurant Schönangerl, where we made one of the best discoveries of the trip—Kaiserschmarren, thick egg pancakes with raisins chopped into bite-size pieces and served with homemade applesauce and powdered sugar. With burning calves—and hopefully carbs—we finally reached the top of the falls. From the overlook, we dodged frigid mist and watched the powerful, plummeting water. The pristine backcountry beckoned to be explored, so we continued on. Gravel crunched under our feet as we hiked the meandering riverside road that led us past fenceless, emerald-green meadows where roaming cows with tinkling bells grazed. We stopped at mountain hut Holz Leckner Alm for some Zipfer Bier as we watched a fisherman casting for trout. The air grew chillier as the sun began to slip behind the mountain peaks. We quickly hiked back to Krimml, barely beating nightfall. At the Klockerhaus, we relaxed over a delightful dinner of freshly caught Forelle (trout) sautéed in a beurre blanc and paired with a crisp Riesling. Morning brought another picture-perfect day. We took our luggage to the lobby for Eurocycle’s prearranged courier delivery to our next hotel. What a great daily service! At the Klockerhaus’ breakfast buffet we fueled up on home-baked breads, cold cuts, cheeses, fruits, cereals, yogurt, and eggs. Afterwards, we packed our panniers, reviewed maps and directions provided by Eurocycle (available only in German), and pedaled our twenty-one-speed bikes across the street, where the Tauern Bike Path: Krimml-Salzburg began. 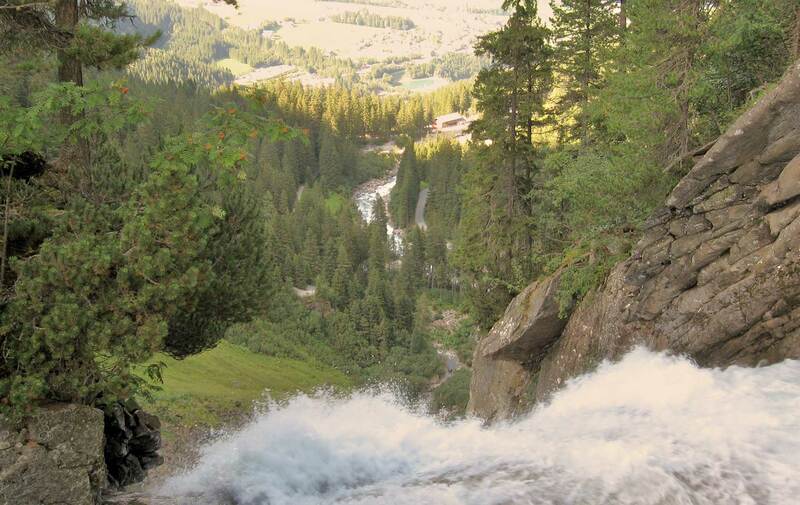 The well-marked gravel path wound downhill, under a bridge, past the falls, and eastward along the silty green Saalach River that flows through Tauern National Park. During the next few hours, the gravel path transitioned to pavement and crisscrossed the river several times, alternating from riverside paths to meandering country lanes. Sandwiched between rolling verdant hills dotted with pretty chalets, we cycled past quintessential Austrian scenery: quaint villages with onion-domed churches, several shaggy goats playing “king of the hill” on their three-tiered goat house and an elderly couple walking hand-in-hand—she wearing a dirndl and he sporting lederhosen. Midway to Stuhlfelden, we spontaneously exited the path and followed signs to a nearby home/café that catered to bicyclists. For an hour, we enjoyed turkey schnitzel salads and I had a chance to practice speaking German. By early afternoon, we were in cozy Stuhlfelden, just outside of the bustling market town of Mittersill. Here, we spent a memorable night at the atmospheric Hotel Gasthof Flatscher (www.hotel-gasthof-flatscher.at). Both our suite and dinner were outstanding. Despite forecasted rain, we arose to another sunny day. After our morning feast at the Flatscher, we pedaled uphill past Stuhlfelden’s white Schloss (castle) and coasted off into the picturesque countryside. The fresh air smelled of wildflowers and sweet grasses. In nearby Uttendorf’s town square, lifelike straw people and Kürbise (pumpkins) were displayed for their upcoming Bauernherbst (harvest festival), which is celebrated throughout the region in late August or early September. Abundant fountains and handy roadside spigots offered fresh drinking water throughout the route. In lively Kaprun, known for its hydroelectric dam and ski mountain, we enjoyed a refreshing Steigl Bier on Hotel Orgler’s (www.hotel-orgler.at) inviting flower-laden terrace, served by contagiously cheerful Frau Dona. For the next several miles, except for a few hilly stretches, we traversed an undulating course that intertwined with the winding Saalach. Sooner than expected, we reached our destination, popular lakeside resort Zell am See (See means “lake”). After settling into our cozy room at Hotel Gasthof Schütthof (www.latini.at) on the city’s outskirts, we again set out on our bikes to explore the shady lakeshore path along the shimmering blue lake with its beautiful mountain backdrop. Crossing over bumpy railroad tracks, we headed downtown in search of the Seilbahn (cable car) that whisks hikers and skiers to Schmittenhöhe’s summit. To reach the station, we pushed our heavy bicycles up several miles of steep switchbacks. Feeling sweaty, thirsty, and tired, we finally arrived in time to take the last trip up. At the top, unfolded before us were stunning panoramas of the lake and endless Alps—some as far away as Switzerland and Germany. Even more exhilarating was the death-defying bike ride back down and into town. That night we returned to Zell am See for its colorful midweek festival in the Marktplatz (market square), where we hobnobbed with locals and enjoyed traditional German music and dinner at a lively sidewalk café. With overcast skies and brisk temperatures, a flotilla of windsurfers rippled the water as we pedaled along the flat, flower-lined path that skirts Zell am See’s pristine lakefront. In the distance, behind emerald-green hills, we glimpsed glacier peaks. Changing course, we veered northeast towards distant snowcaps. The clouds were gone and the sun burned brightly by the time we reached Maria Alm’s Kirche (church) with its renowned five-hundred-year-old Madonna. We stopped briefly to take photos and chat with three fellow cyclists from Berlin, who were biking the same itinerary. Nearby, a brutal hill awaited us; but, soaring down the other side, the sensation of the cool air through my hair and on my skin was great payback! Throughout the afternoon, the scenery constantly changed. We biked along rushing streams, up and over bridges and ravines, through thick forests, and past playful animals and garden gnomes. This route exceeded all my expectations! By late afternoon we reached the outskirts of lovely Lofer and the delightful Gasthof Bad Hochmoos (www.hochmoos.at), where the innkeeper upgraded us to a fabulous suite with stunning views. We capped off a perfect day at Hotel Dax (www.hoteldax.at) with dinner followed by delectable Kaiserschmarren with stewed apricots. Following our breakfast, we biked to Lofer, where I shopped for linens while John videotaped several jovial grandmothers drinking mugs of beer midmorning in the town square. After some confusion with the day’s course, John rerouted us back on track and down a gravel road that snaked along the Salzach. We stopped often to photograph passing white water rafters. One unlucky raft flipped. For a short stretch, we crossed the German border into Lower Bavaria, where the path grew so steep that, in some places, we “hiked” rather than “biked.” However, soon we dipped back into Austria, glided down to the river’s edge and resumed an easy stride. Before long, a shady lakeside Biergarten beckoned us to take a break and the “biking Berliners” joined us. Two of them spoke fluent English. When I asked what it was like when the Berlin Wall came down, they told me that at first they didn’t believe the rumors. Not until they witnessed it on television could they imagine a unified Berlin. The sun felt hot when John and I approached Bad Reichenhall, a spa town once frequented by former Austrian aristocracy like the Habsburgs. We biked downtown and discovered a lively pedestrian-only street that spanned several blocks. Upscale boutiques, sidewalk cafés, and grandame hotels lined both sides of the street. At a bright red Reber-Eis (ice cream) kiosk, we found the creamy, flavored yogurts so delicious that we had seconds. Back on the trail, time passed quickly as we clipped off the remaining miles. Before we knew it, rolling hills and woodland trails led us to Siezenheim, a charming suburb near Salzburg’s Flughafen (airport) and minutes from Gasthof Kamml (www.kamml.com), our final destination. While I hated ending our bike trip, I couldn’t wait to celebrate at our favorite Salzburg institution, the Augustiner Brauerei (brewery) (www.augustinerbier.at). Sitting under chestnut trees with thousands of fellow revelers, we sang along to American hits (so much for oompah-pah) and raised our heavy ceramic liter mugs. “Here’s to gorgeous weather, spectacular scenery, no flats or accidents, downhill cruising, delicious cuisine, and a fabulous finale. Prost!” Life doesn’t get any better than this!